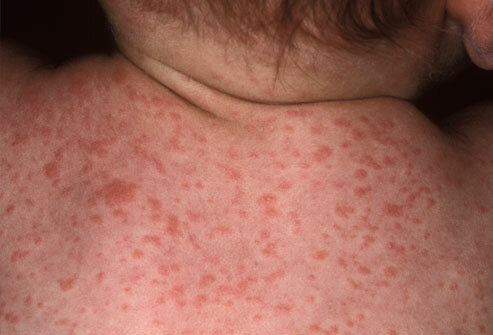 Roseola in baby has several names including Roseola infantum, exanthema subitum, and sixth disease and usually affects children between 6 months of age and two years. Roseola is generally caused by human herpes virus (HHV) either type 6 or 7. These are related to the herpes simplex viruses (HSV), which is more commonly known. Despite the relation of HHV to HSV, it causes very different symptoms and because of this, you won’t see children with roseola developing a genital herpes infections or cold sores. There are many things you can do to relive the symptoms of Roseola in babies. Respiratory illness and fever. In most cases a child with roseola will develop a upper respiratory illness that is mild in nature and this will then be followed by a fever which is high (frequently more than 103° Fahrenheit, 39.5° Celsius). In most cases the fever associated with roseola lasts between 3 and 7 days and the following rash can last anywhere from several hours to several days. Rash. The high fever will usually abruptly end and at this point the child will develop a raised rash on the trunk which then spreads throughout the body. Particular areas which are more likely to be affected include the legs, arms, face, and neck. The spots of this rash will turn white when touched (which is referred to as blanching) and it is possible for individual spots to have a “halo” around them that is lighter in color. Fussiness. During this stage of the illness, the child can be irritable and/or fussy. Swollen lymph nodes and appetite loss. He may also experience swollen lymph nodes in his neck and a decreased appetite. Febrile seizure/ convulsions. Between 10% and 15% of young children will develop febrile seizures due to the fast-rising high fever. Some indicators of a febrile seizure can include a loss of bladder or bowel control; 2 or 3 minutes in which the face, legs, or arms jerk and twitch; or unconsciousness. Your child isn’t drinking, is lethargic, or you can’t keep down the fever. The rash lasting over a week; a previously diagnosed rash lasting over four weeks or not following the expected pattern. Roseola is in fact contagious. It spreads via small drops of fluid that leave the throat and nose of those infected with the disease. The person will expel the drops when they cough, sneeze, laugh, or talk. You become infected when they breathe in the drops or touch their mouths or noses after touching a drop. Babies can spread the infection via coughing. The virus that leads to Roseola isn’t spread by children who already show symptoms of the disease. Instead the infection spreads when a child hasn’t developed the symptoms for Roseola yet and therefore their caregiver isn’t aware that they are infected. This makes it more difficult to prevent infection, making it necessary to always take proper hygienic precautions. Diagnosis: Although your doctor is likely to suspect your child may have roseola based on the fever and his age, most will not give a definitive diagnosis until the rash appears. While there isn’t a blood test to confirm roseola, your child’s doctor can order a blood test to rule out bacterial infections. Below are things you can do to treat and prevent roseola in your baby. Over the counter medications such as ibuprofen and acetaminophen can help reduce the fever your child is experiencing due to roseola. Never give your child aspirin, however, as this medication has been linked to Reye syndrome in children which may eventually cause liver failure or death. Despite old wives’ tales, never treat your child’s fever using cold baths, fans, alcohol rubs, cold water, or ice. Although some parents claim that lukewarm sponge baths lower the fever, there has not been any evidence to support this claim and the bath may make your child uncomfortable. Dehydration is always a risk during a high fever and because of this, it is important to encourage your child to drink plenty of clear fluids. The best options are water (with or without ice chips), electrolyte solutions designed for children (avoid those designed for adults), or clear broth. If your child is still breastfeeding, the breast milk can also help fight dehydration. If your child experiences a febrile seizure (which can happen to 15% of children with roseola), then contact your doctor. Always call 911 if the seizure lasts for over 10 minutes or at any point your child has difficulties breathing. There is some research suggesting that children who have stronger immune systems will recover faster from roseola and other viral illnesses. To improve your child’s immune system, ensure he has a diet that is well-rounded and gets enough sleep. The most important one is to ensure that your child frequently cleans his hands using sanitizer or soap and water. You should also tell him not to share drinks or food with friends or siblings who are feverish. Remember that if a child already has the rash, he will no longer be contagious.